Most work requires meetings, and with good reason—many decisions are simply made more effectively face-to-face. But meetings also come with costs: the time, focus, and attention of everyone in the room. The problem in most workplaces today is the amount of meetings. Specifically, many meetings require meetings about the meeting, which compounds those costs for every person in the room. You’ve probably been pulled into enough unnecessary, unproductive meetings that you’ve lost entire days’ worth of time that could have been used to, you know, do your job. Using a collaboration hub like Slack, you can refocus and even entirely replace the meetings that are unproductive, unfocused, and unnecessary. This starts in channels, where you can share meeting goals and agendas in advance, host a group brainstorming session or gather quick answers, and automatically create searchable archives for easy reference. Doesn’t that sound a lot better than trying to look up an idea in an endless reply-all email chain from months ago? Move your meetings to Slack, and you’ll save valuable time when you could be actually working. Here’s our quick guide to getting started. Daily check-in meetings allow everyone to share updates and goals. And though it’s human nature to want to talk and share ideas, even a 15-minute meeting can quickly spiral out of control and cut into the workday. When you move your daily meeting to a quick check-in on Slack, every single person on your team can save valuable time and weigh in with an update when it’s convenient. Sharing status updates in channels makes it easy to see what everyone is working on, but there’s no need for every person to sync their schedules just to share progress on a project or that day’s to-do list. 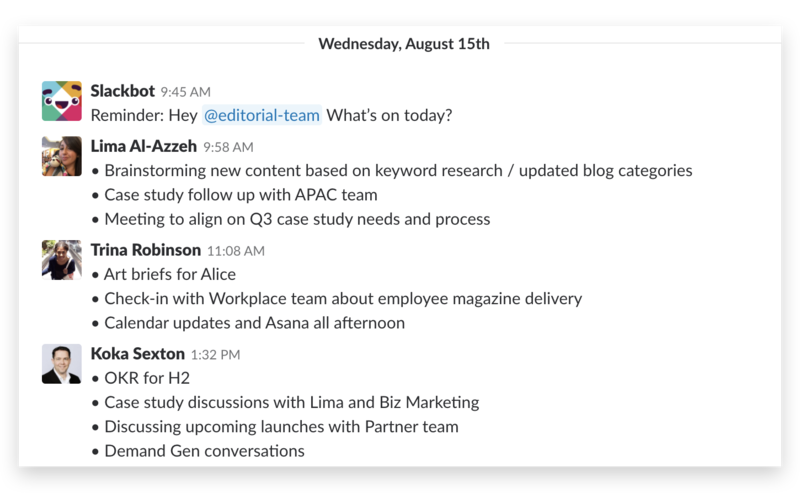 Creating a daily reminder in Slack gives teammates a light nudge to share their agenda for the day ahead, along with any updates. Set it to check in every morning with a friendly prompt to update your team, e.g. Hey @core-product, what’s on today’s schedule? And just like that, everyone can share their status—and then get on with their day. Not everyone can come up with creative concepts on the spot. So the next time you need to brainstorm a solution to a problem, don’t call a meeting. Use Slack to share ideas more organically, as opposed to trying to prepare all of your good points for a meeting at a set time. Planning even smaller, one-on-one meetings is easier with Slack. For any recurring chats you might have with a manager, direct report, or teammate, try creating a new channel with a name like #agendas-jack-jill. Invite the other party to the channel to share questions, concerns, or ideas as they come to mind. Formalize these in-channel right before the meeting, and you’ll be enjoying quicker, more efficient 1:1 meetings in no time. Tip: For 1:1 meetings with remote and distributed teammates, you can actually start an audio or video call right inside your direct message or channel. Rehashing key takeaways adds extra time to the end of a meeting—time that no one is getting back. Move those follow-ups to Slack, where you can share recaps as well as next steps (particularly helpful for anyone who couldn’t attend the meeting in the first place). This sets the expectation that everyone can follow up in the appropriate Slack channels, where all the pertinent information will be shared, saved, and easily searchable. Is there someone who’s directly responsible for a particular follow-up? @mention them in-channel, so everyone knows who they can approach with questions about the task. Calling meetings because you simply can’t find the status updates you need? Then it’s time to get into the habit of posting relevant messages and files in public channels. This is all about transparency. It also makes it easy for managers to quickly get an overview of where key projects stand. It’s equally valuable for new teammates who are getting up to speed. Trying to find the context behind an approval or earlier iterations of design work? That information and any associated files are readily accessible through Slack’s search functionality. This way, managers and individual contributors can spend their valuable face-to-face time working through critical projects and strategy, not providing background and status updates. If you’re looking to trim down time-consuming daily stand-ups, streamline your 1:1s, or clear your calendar for some invaluable focus time, try moving your team to Slack. Your future, more productive team will thank you (and not during a meeting). Slack is the collaboration hub for work, where the right people and information come together so you can work together online as well as you do in person — without all the meetings.